With one child sick and curled up on the sick couch watching cartoons, and another working on a school project, I had a bit of time to play with some of my new stuff this afternoon! We needed a girlie birthday card, and I thought this Elzybells image would be perfect for birthday wishes. Isn’t she just precious? 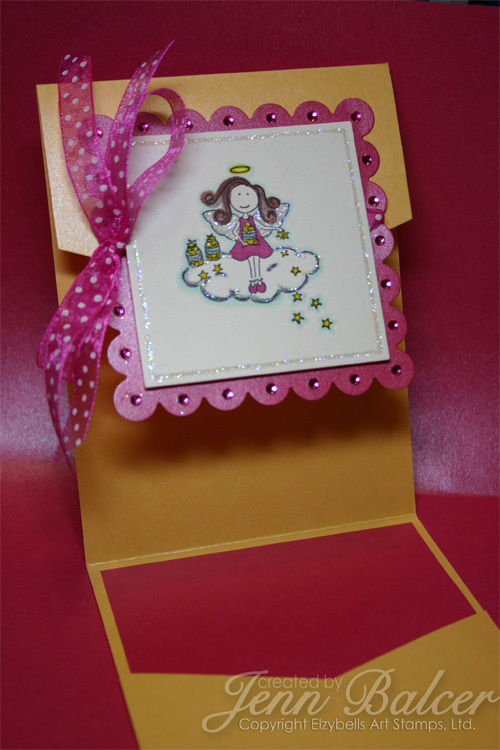 It was SUCH an easy card to make, especially since I started with a premade Envelopment from PaperZone. It’s the most marvelous shimmery, buttery yellow. The built-in pocket is perfect for a gift card ~ something any little girl would love! I wish I’d brought more home with me. . . I stamped the “Peace, dreams & wishes” Elzybell in Palette Noir on Poison Ivory. 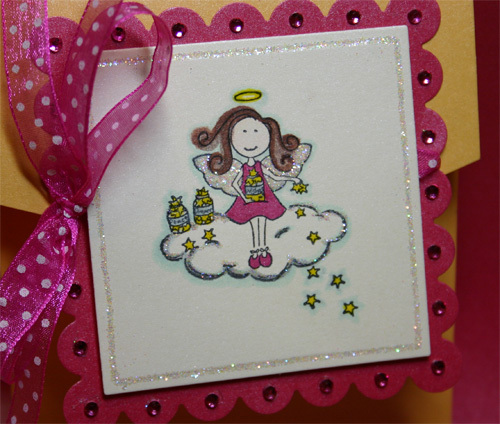 Then, cut and embossed the stamped image as well as some Azalea shimmery cardstock with Nestabilities. I used Copic markers to color the image, Sakura glaze pens for the halo and stars, and a glue pen and Dazzling Diamonds glitter for some glitz. 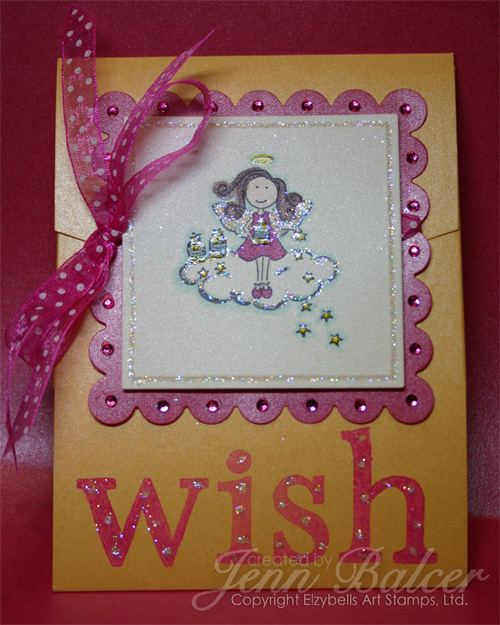 “WISH” was stamped with the A Muse polkadot alpha in Pink Passion craft ink, then highlighted with more glue pen + glitter work. Ribbon is May Arts, and just wraps around the Azalea layer and ties on the side. Pink sparkles are from my stash. A fun detail – the card closes with magnetic snaps that I’ve hidden between the stamped image and scalloped layer and between the envelopment and the shimmery pink layer inside. The snaps are SUPER thin and strong. I love the invisible closure! I just marked where I wanted them to be, removed the adhesive, and attached them before I put the layers together. Super easy card from start to finish. While I did this, Adri put the finishing touches on this guy! The kids in second grade have a project due this week – disguise a turkey so the hungry hunters won’t recognize him. Adri took her task VERY seriously and decided to make hers into a Christmas tree. She colored the provided turkey body green, then we spent quite a bit of time punching out green flowers (which we cut into leaves and curled with a bone folder) and attaching them with some monoadhesive. She sprayed the whole bird with Glimmer Mist and then went to town decorating the tree. There are rhinestone strings, some little strung puff-ball garland stuff, random rhinestones and a chipboard star that’s attached with a rhinestone brad and COVERED in glitter. Since he looked kinda lonely, she decided he needed to be in a room. More is more, right? I created an acetate window for her and she stamped Papertrey and Verve Visual snowflakes in white stazon, and then added some stick on rhinestones to the window frame. It still looked naked, so she cut a hunk of that luscious pomegranate satin ribbon and said, “Here’s a curtain, Mom!” We used more chipboard shapes and Figgy Pudding to wrap the gifts at his feet. I’m proud of her creation and can’t wait to see what her classmates do with theirs! This entry was posted in Personal, Stamped Stuff. Bookmark the permalink. Trackbacks are closed, but you can post a comment. Great, great cards, Jenn! Those elzybells images are soooo cute! Love your blog. Wish I could find more time to get here more often!!! You do some great things with your new stuff!!! Glad you had some time to play!!! 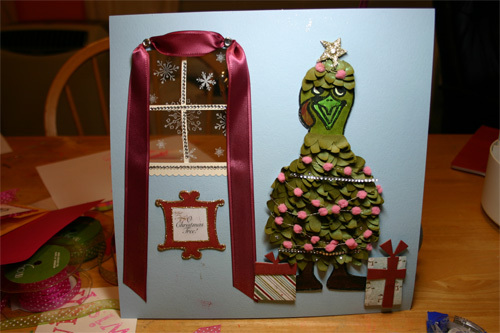 Great card, but I’m amazed at your daughter’s creativity and crafting talents!! That turkey is AMAZING!!! Fantastic job! LOVE the card, girl – LOTSA bling and glitter. Gotta love that! ADORABLE!! OMG… don’t make me want those stamps too Jenn! Oh crud! Between you and Jami I am going to end up with non SU stamps!!! Wow, I just love that Elzybell image. They are all so cute, I don’t know how you ladies choose which one to buy first. Love those lucious colors you chose, Jen, and the magnet closure–genius. I see your talent has rubbed off on Adri as well. What a cute turkey! Shhh, I won’t tell he is in there. 🙂 Happy Halloween, too! I love the Elzybell stamps! I orderd some yesterday. I can’t wait to get them!! Mason had to do the same turkey project! We used lots of glitter, mod-podge and ribbon!! So fun! How cute! Now another use for the Elzybell stamp I placed yesterday! I’m so NOT an out of the box kind of person. That turkey is sooooo great! Very clever idea! I’d say Adri saved it to see another day! Oh my gosh, Adri your “tree” is amazing. Awesome job disguising your turkey. Jenn, your creativity is rubbing off on your daughter…and that’s a really good thing. Thanks for sharing her creation. First of all — I think I picked up that same envelope at PZ, LOL! Good to know it turns out cool! Love little Elzy — I think I might have gotten that same stamp — so sweet, Jenn! Second — OMG, what a fabulous project Adri made!! That girl DOES love the bling! This will surely be the talk of all 2nd grade! love the things you are making with your new goodies-they are just adorable. And Adri’s turkey is just stinkin’ cute-I love all of the details she put into it-she definitely has her mommy’s creative gene!!! Jenn – I had to snort…you wished you would have brought more home….uh, honey…the airports have regulations on that kind of thing now. You have to stop somewhere. But, I agree – this is stinkin’ cute! ……………THUD! That is *plush*, Jenn! Pure *plush*!!! This is so cute!! I love those new (to the states) stamps! Very cool card style, and I love the colors, sparkle and bling!! Oh, what a cute card! Girl, your card is gorgeous! I LOVE what Adri did. She is so talented!!! LOVE that Elzy bling, Jenn!